Jeep has become an American icon, it has had more owners than you can shake a stick at over the last 76 years. Which hasn’t mattered since the Jeep brand has continued to gain in popularity ever since its inception during the World War II. Jeep has had the great ability of releasing many innovative and leading edge SUV models over the years. Jeep doesn’t follow the market trends it makes them. Jeep is well known for its cutting edge concept vehicles, some of which provide Jeep buyers a glimpse of future Jeep models. As part of this process Jeep has released some really crazy off-the-wall concepts. 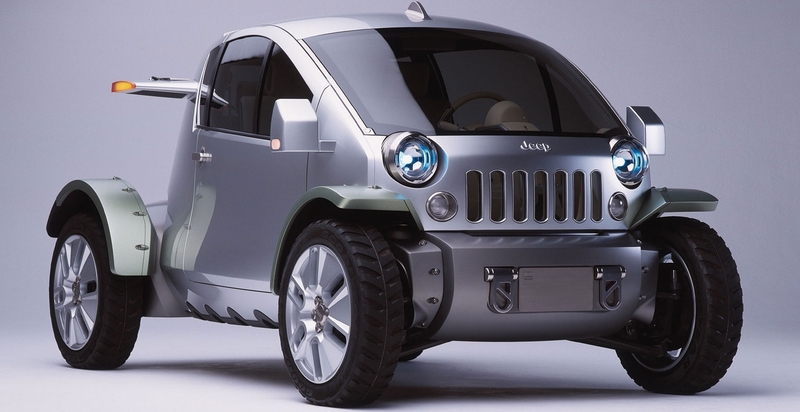 Here are five of the craziest Jeep concept vehicles ever created. Jeep which was owned by Kaiser during this time period was interested in expanding the Jeep lineup for the 1960s. Kaiser contracted with Crown Coach to develop the 1960 Jeep Wide-Trac concept. The end result was what looked like the mixture of a moon vehicle, an amphibious land boat, and a rugged off-road vehicle. For a four-wheel drive vehicle the Wide-Trac was low and wide had three variants – a pickup truck, a camper version based on the pickup, and a passenger van. The Wide-Trac was a more modern version of the cab forward design which Jeep had introduced with its FC which was short for Forward Control which was first introduced for the 1956 model year. The Wide-Trac concept was more than likely an exploration into the possibility of a FC replacement. However that was never meant to be, the FC’s last year of production was 1965, after that a cab forward Jeep never returned. The funny thing is, if the Wide-Trac had ever made it to production it probably would have sold well. With the following Jeep models: CJ, Wagoneer, Commando, and Gladiator seeing a nice steady increase in sales by the late-1960s, Kaiser had thoughts of expanding the Jeep lineup to include car offerings. This plan had good intentions, but it was much harder in practice than in theory to pull off such a feat. The problem was how to build a car that car buyers would want to buy, yet would live up to the rugged reputation of the Jeep name. The solution Kaiser thought was to task the Bolide Motor Car Company to produce the 4-wheel drive 1969 Jeep Bolide XJ-002 concept car, a fiberglass bodied two-seater sports car built on the Jeep Commando platform. It was a sleek sports car with a generous body lift and four wide all-terrain tires. It looked like an Opel GT on steroids without the side doors. The Bolide XJ-002 was powered by a Buick V6 engine mated to a GM sourced Turbo-Hydramatic 400 3-speed automatic transmission. Even though this concept had cartoonish proportions, it seemed to work. The funny thing is due to its fuel efficient V6, great off-road capability, and wild sleek styling, had it been produced it probably would have sold well in the crazy car market of the 1970s. The Jeep XJ-001 concept car was being developed by Kaiser at the same time as Bolide was creating the XJ-002 for Jeep. The XJ-001 just like the Bolide XJ-002 was a Jeep car concept. However it was the polar opposite of the XJ-002 in that it was a Jeep muscle car concept. The XJ-001 however was different than most muscle cars in that it was tiny, it had a very short length of only 144 inches – it was about the size of the mini cars in the 1968-1970 Hanna-Barbera Banana Splits TV show. The XJ-001 was based on the short CJ-5 platform and shared the CJ-5’s very short 81-inch wheelbase. It was a two-seater which had the width and ride height of a muscle car and had a set of wide H60-15 tires and a set of shiny sporty muscle car wheels. The XJ-001 had a low muscle car ride height and was an open air roadster. It may have looked like a low riding car but it had a heavy-duty full-time 4-wheel drive system. The body was fiberglass and had a radical hood scoop and side air extractors which added to the XJ-001’s muscle car look. 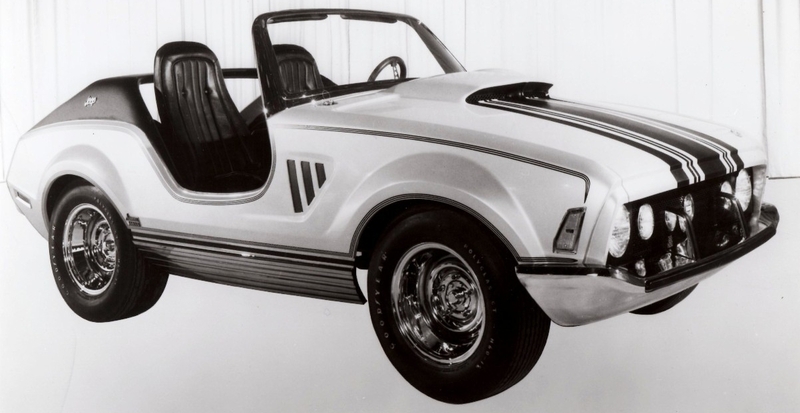 Though overall this car looked like a micro-car it was equipped with AMC’s 360 cubic-inch V8. For a vehicle that was estimated to weigh no more than 2,500 lbs, the XJ-001 if it had made it to production would have been one very fast car. By the mid-1970s, Jeep was humming along. Not only were its vehicles seeing increasing popularity but they were soon becoming 4×4 status vehicles. There was one problem with the move up the status ladder, it generally meant it was harder for those buyers to afford a Jeep who could only afford to pay entry level prices. 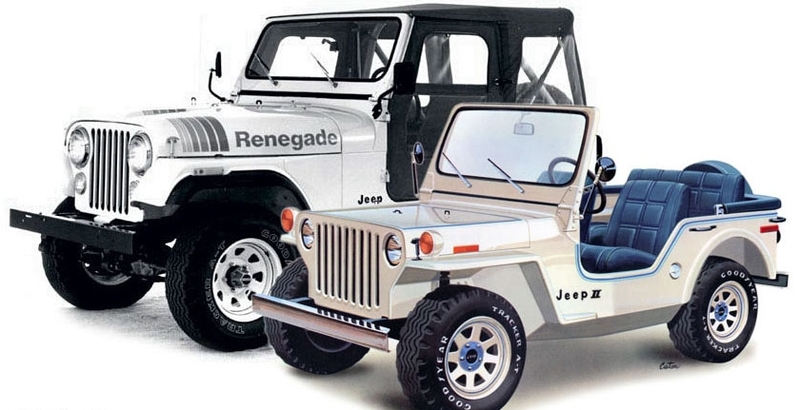 Jeep thought it had the answer with the release of the 1977 Jeep II concept. It was a budget Jeep that was smaller than the CJ5 that if it had been put into production would have a price tag lower than a base CJ5. The Jeep II was a micro sized Jeep. It was 2-feet shorter in length and 8 inches shorter in height than a CJ5. It was smaller than even the pint sized Suzuki Samurai. The Jeep II had all the same boxy styling cues, a fold-down windshield, a ragtop, and seating for four that the CJ5 had. It also was equipped with a 4-wheel drive system and all-terrain tires. For the gasoline frugal 1970s when small economy cars were skyrocketing in sales, the Jeep II seemed like a great idea. However AMC ditched the idea. By 1980, the decreasing sales of the CJ5 versus the increasing sales of the larger CJ7 may have convinced AMC the Jeep II wasn’t such a good idea. There were some off-the-wall concept vehicles during the years when Daimler owned Jeep, yes that’s correct the merger of equals wasn’t a merger it was a Daimler buyout of the Chrysler Corporation (which included the buyout of its Jeep division) in 1998. 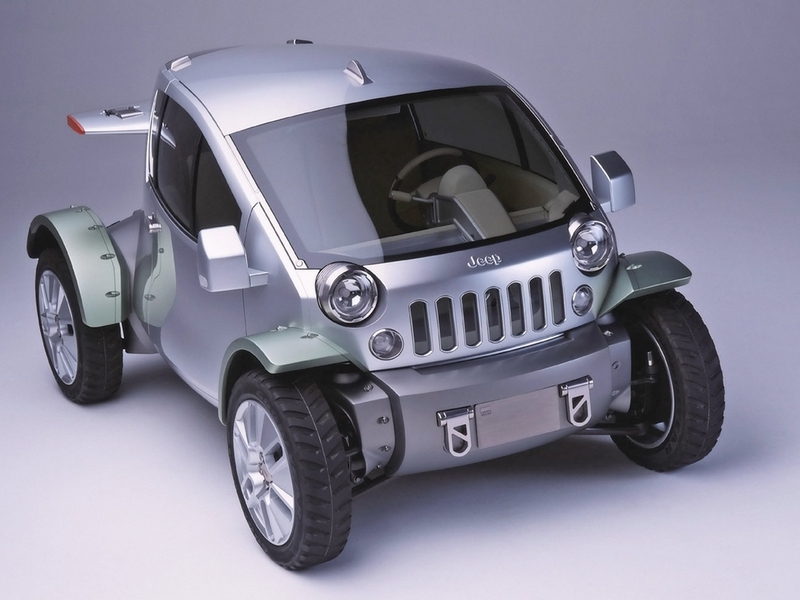 However none were more radical or bizarre than the 2004 Jeep Treo. It looked like designers were trying to merge a Smart Car with a Plymouth Prowler. Its front-end design looked like one of the Minions from Universal Picture’s Despicable Me movie series. The interior was like a cab forward version of the Smart Car with seating for just three people (two seats in the front and one in the back). The Treo had a wide stance, good ground clearance, and even all-terrain tires but its proportions were just too crazy for a production car. Not to mention the crazy horizontal aircraft wings protruding from the upper rear quarter panels which housed the rear taillights, looked absolutely ridiculous. Overall the Treo’s looks made the homely styling of the Nissan Cube and Pontiac Aztec look wonderful in comparison. Fortunately the Treo was never produced and Daimler no longer owns Jeep.